Elwin Melvin COOP [Parents] [scrapbook] "Dude, Uncle Dude" 1 was born 2 on 7 Jul 1903 in Condon, Harney County, Oregon. He died 3 on 28 Oct 1990 in Independence, Jackson County, Mo. The cause of death was Pneumonia. He married Arthene Mabel HARP on 19 Jan 1922 in Vancouver, Clark County, Washington. Arthene Mabel HARP [Parents] [scrapbook] "Lolo" was born 1 on 28 Aug 1904 in Condon, Gilliam County, Oregon. She died 2 in May 1977 in Camas, Clark County, Washington. The cause of death was Pneumonia Secondary to Alzheimer's Disease. She was buried 3 on 20 May 1977 in Brush Prairie Cemetery, Brush Prairie, Clark County, Washington. She married Elwin Melvin COOP on 19 Jan 1922 in Vancouver, Clark County, Washington. Arthene developed scarlet fever after the delivery of her son, Jack Coop, and her sister, Helene Harp took care of Jack during her convalescence. William Marion HARP Jr. [Parents] [scrapbook] "Willie" 1 was born on 27 Dec 1877 in Perry County, Indiana. He died on 17 Sep 1945 in Goldendale, Klickitat County, Washington. He was buried in Section 2 (8th Street), Lot 4, I. o. o. F. Section of Mountain View Cemetery, Goldendale, Klickitat County, Washington. He married Cynthia Alice THARP on 28 Nov 1901 in Lamoni, Decatur County, Iowa. Some records show his date of birth as 25 December 1878. William Marion Harp's children called him "Poppy", and his grandchildren called him "Gramps". U.S. Census records from 1880 showed that William M. Harp, then three years of age, lived in Davis City, Decatur County, Iowa, with his parents, William and Mary, and his brother, Charles E. Harp, then five years of age. Helped to build the Maryhill Museum. During construction, he was injured by a door being dropped on his foot. William Marion Harp's headstone shows he was a member of the Freemasons. William Harp was a seven-month baby. H was so small, they did not even clothe him--just kept him in a box lined with cotton and covered with blankets. They did not know if he would live or die. His parents kept his little box always near the wood-burning kitchen range. My grandmother, Pauline, always speaks fondly of her 'Uncle Willie'. Always was kind and gentle. Uncle Willie's favorite piece of the chicken was the gizzard. It was also my grandmother's--the two would often see who could get it first. When Uncle Willie left to live in the state of Washington, it nearly killed his mother as she knew it was so far away and trips back would be few. Willie's younger brother, Joseph Bradford, was my great grandfataher--a good, kind man with a witty sense of humor, a trait with many of the Harps. I knew him very well and still miss him. William Marion Harp was born, December 25, 1877, in Indiana. He passed away Sept. 14, 1945 at the age of 67 years, 9 months and 20 days. He married Cynthia Alice Tharp, November 28, 1901 in Lamoni, Iowa. To this union was born five daughters, one died in infancy. He joined the Reorganized Church of Jesus Christ of Latter Day Saints in his early teens and has been a faithful member ever since. life there and in Wishram. He has been a member of the Masonic lodge for a number of years. He has been a well known and liked member of the community. He leaves to mourn his wife, Mrs. Cynthia Harp, four daughters, Mrs. Helen Spencer, Wishram; Mrs, Elwin Coop, Camas; Mrs. Alfred Carroll, Vancouver and Mrs. Ardith Raybum of Wishram. Nine grandchildren and three brothers also survive. Services were held Monday in Goldendale at 2:00 p. m. with Elder Leonard S. Rhodes of Washougal officiating, assisted by Elder Frank Chapman of Vancouver. Interment was made in the Odd Fellow cemetery. He joined the Reorganized Church of Jesus Christ of Later Day Saints in his early teens and had been a faithful member. He also was a member of the Masonic lodge. The family came to Condon, Ore., in 1904 and in 1909 moved to Maryhill. He spent the remainder of his life there and in Wishram. He leaves the wife, four daughters, Mrs. Helen [sic] Spencer, Wishram; Mrs. Elwin Carp, Camas; Mrs. Alfred Carroll, Vancouver and Mrs. Ardith Rayburn, Wishram; also three brothers and nine grandchildren. Cynthia Alice THARP [Parents] [scrapbook] 1 was born on 15 Jan 1881 in Kewanee, Henry County, Illinois. She died on 21 Mar 1950 in Vancouver, Clark County, Washington. She was buried in Mountain View Cemetery, Goldendale, Klickitat County, Washington. She married William Marion HARP Jr. on 28 Nov 1901 in Lamoni, Decatur County, Iowa. Cynthia Alice Harp was born January 15, 1881 in Kewanee, Ill. She was baptized in the Reorganized Church of Jesus Christ of Latter Day Saints during her early girlhood. On November 28, 1901 at Lamoni, Iowa she was united in marriage with William Marion Harp. In 1902 they came west and settled in Condon, Oregon. A few years later they came to Maryhill where they made thier home until 1930 when they moved to Wishram. They kept their home there until Mr. Harp's death in 1945. Cynthia Harp passed away in a Vancouver hospital March 21, 1950 at the age of 69 years, two months and five days. She leaves a brother Tom Tharp of Maryhill, four daughters, Mrs. Helene Spencer of Vancouver, Mrs. E. M. Coop of Camas, Mrs. Nellie Carroll of Vancouver, Mrs. A. W. Rayburn of Wishram and nine grandchildren. She is also missed by innumerable friends and neighbors. Just as I used to do. F iii Irene Gladys HARP [scrapbook] 1 was born in Mar 1906 in Condon, Gilliam County, Oregon. She died in Apr 1906 in Condon, Gilliam County, Oregon. The cause of death was malformed heart and lungs. She was buried in Apr 1906 in Condon, Gilliam County, Oregon. Irene Gladys Harp died in infancy at age 1 and one-half months of a then unknown cardiac birth defect. Some family records show her birth year as 1905. William Marion HARP [Parents] [scrapbook] 1 was born on 29 Jul 1850 in near Rawick, Nelson County, Kentucky. He died on 17 Feb 1927 in at his home in east Lamoni, Decatur County, Iowa. He was buried on 18 Feb 1927 in Rose Hill Cemetery, Lamoni, Decatur County, Iowa. He married Mary Ellen LAMPKINS on 3 Nov 1874 in Perry County, Indiana. Some records show William Marion Harp was born in Marion County, Kentucky. Brothers John Henry and William Marion Harp married sisters, Susan Kathryn and Mary Ellen Lampkins. U.S. Census records from 1880 showed William Marion Harp was a day laborer in Davis City, Decatur County, Iowa, and that he lived there with his wife, Mary, and sons Charles E., then five years of age, and William M. Harp, then three years of age. William Marion Harp went by his middle name. William Marion Harp came to Lamoni, Decatur County, Iowa, from Mollen, Perry County, Indiana, where he had been living for a time prior to that date. William Marion Harp, second son of John Greenberry and Eliza Jane Harp, was born near Rawick, Nelson County, Kentucky, July 29, 1850, and passed away at his home in east Lamoni, February 17, 1927. He was married November 3, 1874, to Mary Ellen Lampkins and to this union were born five children: four boys and one girl. He came to Lamoni, Iowa, from Mollen, Perry County, Indiana, where he had been living for a time prior to that date, and has resided in this vicinity the greater part of the time since that. The deceased was baptized into the R.L.D.S. October 6, 1878. He is survived by his companion and four sons, Charles E., Joseph B., and Francis H. Harp of Lamoni and William M. Harp of Mary Hill, washington. His daughter, Florence Pearl, died September 1893. He also leaves 3 brothers, one sister, seventeen grandchildren, and 3 great-grandchildren. Funeral services were held at the home of his son, Charles E. Harp. The body was laid to rest in Rose Hill Cemetery. Mary Ellen LAMPKINS [Parents] [scrapbook] 1 was born on 3 Feb 1858 in Alton, Perry County, Indiana. She died on 18 Sep 1932 in Lamoni, Decatur County, Iowa. She was buried in Rose Hill Cemetery, Lamoni, Decatur County, Iowa. She married William Marion HARP on 3 Nov 1874 in Perry County, Indiana. Some family records show her year of death as 1929. U.S. Census records from 1880 showed Mary Ellen Lampkins Harp was a housekeeper (assuming for her family, not for hire) in Davis City, Decatur County, Iowa, and that she lived there with her husband, William Marion Harp, and sons Charles E., then five years of age, and William M. Harp, then three years of age. Mary Ellen Lambkin (sic), daughter of Mr. and Mrs. Lewis Lambkin, was born in Alton, Ind., February 3, 1858. Her youth was spent near Alton, where she was married to Marion Harp November 3, 1874. They came to Decatur County from Indianas in 1880, the next year after the town of Lamoni was established, and settled in Davic City, where Mr. Harp was employed by S. V. Bailey in a sawmill for a number of years. Removing to Independence, Mo., in 1882, they followed the farming industry in that locality for a couple of years, but returned to Iowa in 1884, settling on a farm in the Evergreen neighborhood near Lamoni. They later bought the farm now occupied by Mode Sandage, which they sold and moved to town about 1920. Mr. Harp passed away in 1927, since which time Mrs. Harp had made her home with her son, Charles, and family. Deceased was the mother of five children: Charles E., Lamoni; William M., Wishram, Washington; Joseph B., Lamoni; Florence Pearl, who died at the age of 6 in 1893; Francis H., Lamoni. There survive also 18 grandchildren and 7 great grandchildren. 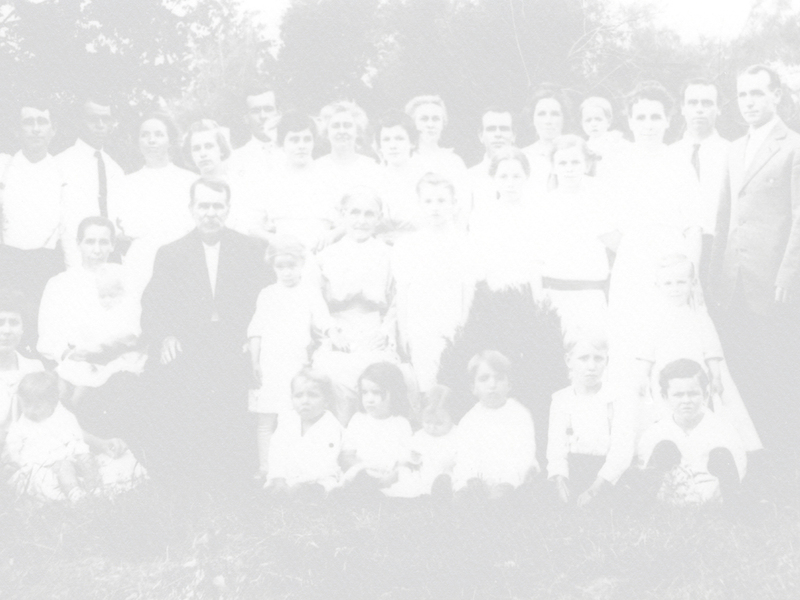 Mrs. Harp was the last surviving member of her father's family of eleven sons and daughters. Mrs. Harp was affiliated with the Roman Catholic Church in her youth, but was converted with 12 others of her faith to the belief of the Reorganized Church of Jesus Christ of Latter Day Saints, and was baptized in 1878 by Elder Harbart Scott in Indiana. She remained faithful to her belief to the end. Mrs. Harp was a woman of quiet, unassuming disposition, who ministered patiently not only to the needs of her own family, but wherever sickness and suffering gave opportunity for loving service. Many a person was nursed through lingering illness in her home, and this servicee was always given uncompainingly. Thus she merited the unceasing care and splendid nursing given her by her daughter-in-law during the declining years of her life. During her last illness she was patient and appreciateive of all that was done for her, often speaking to others of her fortunate surroundings. Mrs. Harp passed away Sunday, September 18. Funeral services were conducted from the White Home, Tuesday afternoon, in charge of Joseph Lane; sermon by T.J. Bell. Remains were laid to rest in Rose Hill. M ii William Marion HARP Jr.
F iv Florence Pearl HARP was born on 18 Nov 1886 in Davis City, Decatur County, Iowa. She died on 10 Sep 1892 in Davis City, Decatur County, Iowa. The cause of death was diptheria. She was buried in Rose Hill Cemetery, Lamoni, Decatur County, Iowa. The death of William Marion and Mary Harp's only girl, Florence Pearl Harp, prompted the taking of a family photo in about 1893. As Mary Ellen had no family photos of her children, she gathered her remaining children and husband and, along with herself, traveled to town (Lamoni, Iowa) and had the photo taken at Brackenberry's Studio. F vi Mary Arlene HARP was born on 13 Jun 1901 in Eagleville, Harrison County, Missouri. She died . F vii Dorris Dell HARP was born on 30 Nov 1910 in Eagleville, Harrison County, Missouri. She died . Charles Francis THARP [Parents] [scrapbook] "Frank" 1 was born on 8 Jun 1853 in Kewanee, Henry County, Illinois. He died on 24 Aug 1912 in Condon, Gilliam County, Oregon. He was buried on 25 Aug 1912 in Condon, Gilliam County, Oregon. He married Sarah Ann WHITEHOUSE on 25 Dec 1877 in Henry County, Illinois. 1880 U.S. Census records show his occupation as farmer. Shortly after they were married, they moved to South Dakota, where they took up a homestead, living the hard industrious life of the pioneer. Their house was of sod. Several years later they sold the homestead and moved to Condon, Oregon, were they farmed. Coming to Columbus, now Marryhill, in 1910, they worked for Samuel Hill on his newly acquired acres, that now form the Hill estate. Worked as a foreman for Phillips and Abbot Ranch. Raised wheat. Sarah Ann WHITEHOUSE [Parents] [scrapbook] 1 was born on 2 May 1859 in Staffordshire, England. She died on 14 Mar 1934 in Columbus (now Maryhill), Klickitat County, Washington. She was buried in Columbus (now Maryhill), Klickitat County, Washington. She married Charles Francis THARP on 25 Dec 1877 in Henry County, Illinois. Some records show her place of birth as Kewanee, Henry County, Illinois. Her granddaughter, Nellie Elda Harp Wong, told Terry Stone in an interview that Sarah Ann Whitehouse came over from England when she was 10 years of age, in about 1869. NOTE: In reading the obituaries from the RLDS Saints Herald newspaper, keep in mind that terms such as Bro., Sister, Elder and Father may denote a position within the CHURCH and may have no relationship to the bloodlines of the deceased. These terms are most always capitalized and precede a persons name as a "title". If you find your relative in a "Saints" obituary, you may also wish to read the sections on this site related to RLDS and the RLDS Branch Records for more information and clarification. Sarah Ann Whitehouse was born May 2nd, 1859, at Staffordshire, England. She died March 14th, 1934, at Maryhill, Washington. The family moved from England in 1869, settling in Kewanee, Ill. Here she grew to womanhood. At the age of twelve she joined The Reorganized Church of Jesus Christ of Latter Day Saints. She kept that faith to the end. In 1877 she was married to C.F Tharp. They moved out to the Dakotas, where they took up a homestead, living the hard industrious life of the pioneer,. Several years later they sold the homestead and moved to Condon, Oregon, where they farmed. Coming to Columbus, now Maryhill, in 1910, they worked for Samuel Hill on his newly acquired acres, that now form the Hill estate. Seven children were born to Mr. and Mrs. Tharp. Four died in infancy. Mr. Tharp died August 24th, 1912. Since then Mrs. Tharp has made her home with her son Thomas. Her oldest son, William Tharp died in January, 1918. She leaves to mourn her loss a son, Thomas Tharp, Maryhill, a daughter, Mrs. William Harp, of Wishram, four granddaughters, two great grandchildren, one brother, Alma Whitehouse, of Chicago, and a host of relatives and friends. Rev. W. T. Jordan conducted the funeral services at the Christian Advent church at Maryhill, and the services at the grave in the Maryhill cemetery. Mrs. Tharp was a kind and generous friend and neighbor. Though a great sufferer she always took a kindly interest in every one and the affairs of the community. The beautiful flowers that covered the grave were a tribute of love form her many friends. "From the ranks our friends are dropping. yet to memory they are dear, still in spirit we behold them And in dreams they hover near. We shall meet them in the morning When our work on earth is done. At the river--blessed river, We shall gather one by one." M i William Francis THARP [scrapbook] was born on 6 Oct 1878 in Kewanee, Henry County, Illinois. He died in Jan 1918. U.S. Census records show William F. Tharp and his parents living in Galva, Henry County, Illinois in 1880. Some records show his middle name as Frank. U ii C. F. and Sarah THARP Child 2 was born in 1879/1880. C. F. and Sarah THARP Child 2 died in 1879/1880. This child died in infancy. U iv C. F. and Sarah THARP Child 4 was born in 1881/1882. C. F. and Sarah THARP Child 4 died in 1881/1882. U v C. F. and Sarah THARP Child 5 was born in 1883/1884. C. F. and Sarah THARP Child 5 died in 1883/1884. U vi C. F. and Sarah THARP Child 6 was born in 1885/1886. C. F. and Sarah THARP Child 6 died in 1885/1886. M vii Thomas Arthur THARP [scrapbook] "Uncle Tommy" was born in Sep 1886 in Lamoni, Decatur County, Iowa. He died in 1957 in Camas, Clark County, Washington. The cause of death was Stroke secondary to heart attack. He was buried in Mountain View Cemetery, Goldendale, Klickitat County, Washington. 1920 Klickitat County, Washington, census records show Thomas Tharp was born in South Dakota. The records also show his last name as Whitehouse, which is in error. Thomas Tharp worked for Samuel Hill, who owned the Maryhill Land Company and was the famous developer of the Columbia Gorge between Oregon and Washington in the early part of the 20th Century. Thomas Tharp never married. Garland Cleon YORK [Parents] "Red" was born 1 on 23 Jun 1902 in Emmett, Texas. He died 2 on 14 Dec 1958 in Utah. He married 3 Lottie Lee WILHOIT on 14 May 1933 in Carlsbad, Eddy County, New Mexico. The accuracy of this information is uncertain as the submitter cannot be contacted for confirmation. For example, the Social Security Death index shows a Garland York, born 16 October 1909, with a death date of October 1983 in Houston, Texas. This does not square with most family memories and does not contain his middle name, which is a recognized family name. Owned Red's Steakhouse in Moab, Utah. Lottie Lee WILHOIT was born 1 on 29 Dec 1893 in Peoria, Texas. She died on 12 May 1991 in Lovington, Lea County, New Mexico. She was buried in Lovington, Lea County, New Mexico at the Lovington Cemetery. She married 2 Garland Cleon YORK on 14 May 1933 in Carlsbad, Eddy County, New Mexico. John Greenberry HARP [Parents] was born on 9 Mar 1827 in Nelson County, Kentucky. He died on 15 Feb 1907 in home of his son, Harvey, Davis City, Decatur County, Iowa. The cause of death was complications due to stroke. He was buried on 18 Feb 1907 in Rose Hill, Lamoni, Decatur, Iowa. He married Eliza Jane DOWNS on 25 Oct 1847 in Bardstown, Nelson County, Kentucky. Some records show he was born in Marion County, Kentucky, in 1824. Some family records show his date of birth as 6 March 1825. Some LDS records show his date of death as 17 February, though this is likely his burial date. Some records show his middle name spelled Greenbury. He often went by his middle name. According to John William Hedges II, fifth great-grandson, John Greenberry Harp fought in the Civil War. The 1880 U.S. Census record show John Greenberry Harp's occupation was farmer. At this time his sons, Thomas, Charles, George, and Fred Harp were living at home and assisting him as farm hands. His son, Joseph, then 8 years old, and daughter, Rebecca, then 5 years old, also lived with them. They lived on a farm near Fayette, Decatur County, Iowa. Harp.--John G.B. Harp, died at the home of his son Harvey, in Leon, Sunday, February 15, aged eighty-two years, eleven months, and eleven days. He had been feeble for a long time, and two weeks ago had a stroke of paralysis. He was born in Marion County, Kentucky, in 1824, and was married there about sixty years ago. They moved to Perry County, Indiana, in 1855, and to Decatur County in 1860, living in New Buda Township until the death of Mrs. Harp two or three years ago, since which he has made his home with his son Marion, south of Lamoni. Eleven children were born to Mr. Harp, seven sons and two daughters surviving him. One son, James, living on the old farm in New Buda was seriously ill. Because of this and the absence of others of his children, no sermon was preached, a few remarks and prayer being offered by Elder H.A. Stebbins at the grave in Rosehill Cemetery, Monday afternoon, February 18. Eliza Jane DOWNS [Parents] was born on 27 Dec 1825 in Bardstown, Nelson County, Kentucky. She died on 15 Mar 1905 in her home, Davis City, Decatur County, Iowa. The cause of death was brain cancer. She was buried on 17 Mar 1905 in Rose Hill Cemetery, Lamoni, Decatur, Iowa. She married John Greenberry HARP on 25 Oct 1847 in Bardstown, Nelson County, Kentucky. Some records show her date of birth as 27 November 1828 and her date of death as 15 March 1904. Some family records show her year of birth as 1826. HARP--at their home four miles south of Davis City, March 15, 1905, Mrs. J. Harp, wife of John G. B. Harp, died of cancer, aged 79 years 2 months and 18 days. She was born in Nelson County, Kentucky, December 27, 1825. In 1847 she was married to Mr. Harp. Of eleven children born to them ten are living, namely, William Marion, John H., Martha Elizabeth, Joseph, Thomas J., Harvey, George A., Francis N., James M. and Rebekah. Most of them live in this county. In March, 1880, Mr. and Mrs. Harp came here from Perry county, Indiana, and have been residents just 25 years. As a family they have been favorably known for their integrity. Mrs. Harp was an excellent woman, a devoted wife and mother and a faithful member of the Reorganized Church of Jesus Christ, having united with it in 1879. For months prior to death she suffered greatly with a cancer, but endured patiently. It was in her forehead and began more than three years ago. Funeral services were held at the home, Elder James McDillit of Davis City preaching the sermon. The family and friends came to Lamoni and laid her body in Rose Hill Cemetery, where Elder H. A. Stebbins spoke a few words and offered prayer. M x Francis Neeland HARP was born on 19 Mar 1869 in Perry County, Indiana. He died on 7 Sep 1906. Harold WONG was born 1 on 29 Nov 1918. He died 2 on 10 Sep 1993 in Kennewick, Benton County, Washington. He married Nellie Elda HARP. Harold Wong was a lifelong cook, and worked mostly for the Thunderbird Inn in the Tri-Cities (Kennewick), Washington. Harold and Nellie adopted two sons. Nellie Elda HARP [Parents] [scrapbook] was born on 30 Jul 1912 in Maryhill, Klickitat County, Washington. She died on 19 Mar 2011 in Kennewick, Benton County, Washington. The cause of death was pneumonia, Alzheimer's-related syndrome. She was buried in Creamated. She married Harold WONG. Nellie Elda Harp was born at home. Nellie E. Wong, 98, of Kennewick, died March 19 in Kennewick. She was born in Maryhill [Klickitat County, Washington] and lived in the Tri-Cities for 45 years. She was a homemaker. Lyle James SPENCER [Parents] [scrapbook] was born 1 on 24 Jan 1913 in Michigan. He died 2 on 12 Feb 1983 in Va Medical Center, Seattle, King County, Washington. The cause of death was respiratory failure, bronchopneumonia, lung cancer, emphysema. He was buried 3 on 22 Feb 1983 in Plot C, No. 546, Willamette National Cemetery, Portland, Multnomah County, Oregon. He married Helene Florence HARP on 12 Jul 1936 in Clackamas County, Oregon. The marriage ended in divorce. Grace Stone, his daughter, said that his place of birth was Big Rock, Kansas or Arkansas. Helene Florence HARP [Parents] [scrapbook] "Nanny" 1 was born 2, 3 on 28 Sep 1902 in Lamoni, Decatur County, Iowa. She died 4 on 16 Nov 1986 in Goldendale, Klickitat County, Washington. The cause of death was cardio-pulmonary arrest, ASVD, complications due to osteoporosis and Alzheimers disease. She was buried 5 on 19 Nov 1986 in Goldendale, Klickitat County, Washington, at the I. o. o. F. Cemetery. She married Lyle James SPENCER on 12 Jul 1936 in Clackamas County, Oregon. The marriage ended in divorce. Some records, including her death certificate, show Helene born in 1901. Helene Spencer was known to her grandchildren as Grammy Spencer, and to her nieces and nephews as Aunt Nan. Gary Joe STONE [Parents] [scrapbook] "Papa" was born 1 on 1 May 1935 in Lovington, Lea County, New Mexico. He died 2, 3 on 3 Jan 1992 in Hermiston, Oregon, at Good Shepherd Hospital. The cause of death was lung Cancer. He was buried 4 on 6 Jan 1992 in Goldendale, Klickitat County, Washington, at the I. o. o. F. Cemetery. He married Grace Florence SPENCER on 1 May 1955 in Goldendale, Klickitat County, Washington, Fred Stone Residence. He had other parents. Gary Stone was a VFR-rated private pilot, who was licensed at the age of 16. When he was only 17, he purchased a canary yellow Taylorcraft in partnership with George Beebee, of Goldendale, Washington. They kept the plane at the Dallesport, Washington, airport. Unfortunately, Mr. Beebee crashed the aircraft, and because the repairs were not affordable, the plane was sold. It was later restored by its new owners. Terry Stone has seen it flying in the 1980's on occasion around the Kennewick, Washington, area. Gary Stone was also a radio control enthusiast, and built nearly a hundred balsa units from scratch, flying them in radio clubs in Albany and Corvallis, Oregon, and in Boardman, Oregon. Many of the aircraft were his own design, and featured unique innovations in the servo mechanisms, crash-proof wings, and landing gear. He also perfected many U-control designs. Gary Stone was primarily a construction surveyor throughout his professional life, working in Klickitat County, Washington, and Northern California. He participated in such projects as the diversion tunnel for the Hellhole Dam on the American River in California (1964-5), the Bay Area Rapid Transit Trans-Bay Tube between Oakland and San Francisco (1968-71), the powerhouse for the Oroville Dam in California (1972-73), and the second powerhouse for the Bonneville Dam on the Columbia River (1979-1981). Working with Peter Kiewit Sons, he developed a one-of-a-kind survey barge, among the first to use lasers in surveying, which could be deployed on the waters of the Bay and provide a usable and stable platform for measurements despite the water. In 1975, Gary obtained an Associate Arts degree in math and engineering from Sierra Community College in Rocklin, California. In his later years, he taught surveying, first aid, and heavy equipment operation for the Operating Engineers training schools at Ranch Marietta, California, Camp Adair, Oregon, and Boardman, Oregon. He was also a skilled videographer, and produced several films for those schools. Gary was a skilled wood worker, and examples of his craft can be found in the Lessie Stone estate and furniture and tool boxes owned by his children. One of his signature pieces was the hand-worked hardwood cover plates he made for light switches and electrical outlets. Gary Stone's residence at death was Boardman, Morrow County, Oregon.